Delabole Roofing Slate...The “Rolls-Royce” of slate, world renowned for extreme durability and a service life measured in centuries......In fact, our roofing slate lasts so long, our only “true competition” is the slate we sold 100 years ago! Delabole Slate is not a geological term. 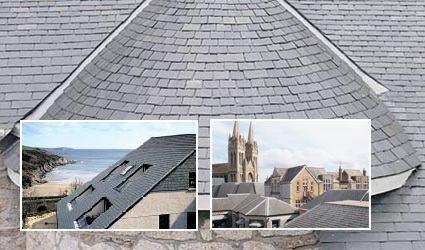 It is the centuries old trade name for products of the Delabole Slate Quarry that has exclusive access to the very best of Cornish slate reserves. There is no other slate quite like it, which is probably why the quarry has operated for 800 years or more and is still the oldest and largest slate quarry in both Cornwall and England. Here at the Delabole Slate Quarry in North Cornwall, we still make our famous natural roofing slate in the traditional way. Hand-made by Cornish craftsmen using skills handed down from father to son for generations. Our use of traditional crafting methods gives each roofing slate a natural and individual finish that ensures your roof will have a real "presence". The aesthetic appeal and enduring qualities of this natural material are truly second to none.